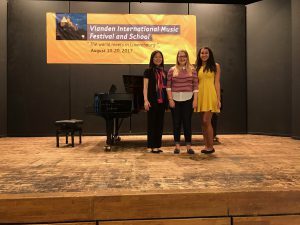 On August 7-21, UCF piano professor Dr. Yun-Ling Hsu and two piano students Daria Park and Danielle Buckles attended the Vianden International Music Festival and Summer School in Vianden, Luxembourg. The festival is a two-week intensive summer music performance program for international young talented musicians, guest artists, and distinguished faculty from U.S.A., Canada, China, South Korea, Taiwan, Luxembourg, Belgium and Germany. Dr. Hsu has been invited by the festival Artist Director Semyon Rozin before, in 2015, and she has been invited back to the 2018 festival. As guest piano faculty, Dr. Yun-Ling Hsu taught lessons, coached chamber music, and performed in faculty recitals. Her festival performance highlight included the European Premier on a trio work (2012) for Horn, Violin and Piano by the American composer Eric Ewazen. Daria Park, a senior, and Danielle Buckles, a sophomore, two UCF students majoring in Bachelor of Music degree in piano performance, were auditioned and accepted by the festival. In Festival each of them rehearsed daily with other participants and performed concerts in Vianden, Luxembourg and Neuerburg, Germany on various works of collaborative piano and chamber music. Read more about the festival and Dr. Hsu’s involvement here. See the article featuring Daria Park from Luxembourg’s local newspaper here. Photo: UCF piano student Daria Park plays the piano in a trio rehearsal with oboe and bassoon players.